Description: The morning when time stood still for Jean and Robert. She opens her eyes. Little green numbers glow at her out of the darkness. Hundreds of them, arranged in circles. They seem to be everywhere. They are everywhere. The shadows are full of clocks, but there is no sound of ticking. Not one of them is working. She can’t make out the hands, but she doesn’t need to. She has set them all at ten to two, the way she has seen in magazines. Robert mutters something in his sleep. She gets out of bed quietly, careful not to wake him. That song is on. Again. It is the only thing they play at this time of the morning. Radio 2. 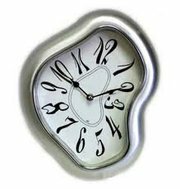 It is good for the time, at least – the clock on the cooker is broken. She prepares a slice of toast over the front ring; the grill fused months ago. A wee drop salmon spread and a cup of tea while the transistor hisses – something about being a star, that’s what you wanted. She would be able to make out the words if she turned it up, but she doesn’t want to wake Robert. She carefully spoons more sugar into her cup, making sure not to rattle the china. She is supposed to be on Sweetex, but you only, she tells herself, live once. The last of the display mats are in a polythene bag on the couch. Robert will take them down to the shop later. She lifts her coat off the carpet. It is a raincoat, a summer design. The material is thin, but the underfloor heating has warmed it up nice. In any case, it is only a short walk to the school. She is pulling the front door shut when she remembers the ashtray. She goes back to look, and sighs. She empties it before she leaves. The snow crackles. It has turned to ice during the night. She has to walk slowly, picking out each step with care. The slide the kids made yesterday is still there, taking up most of the pavement outside the gates. She walks carefully round it and into the playground. A path has been cleared all the way to the main door. It is locked. God, she thinks, not again. She finds the key in her pocket. It feels warm in her hand. She nudges the metal cover to the side and inserts the key in the hole. The lights stutter before they come on. The clock in the foyer says five past six. She watches the second hand click one, two, three, four times, just to make sure it is working. There is an echo. Obviously, Tommy isn’t here. Of course he isn’t; the door was locked. She knows fine where he is. In his bed, still drunk. She switches on the light in the Cleaners’ Room, which is no more than a large cupboard with a sink and enough space for a few chairs. She likes to have a cup of tea waiting for the girls when they arrive. She is spooning sugar into the cups when the phone rings in the Headmaster’s office. She has been expecting it. ‘Jean? It’s Tommy. Look, eh...oh, christ.’ Silence as he sorts himself out. ‘Are you there? She is laughing as she replaces the receiver. Does he want her to go out and clean the pavement? That isn’t going to happen, not in a million years it isn’t. The Region pays her to clean classrooms. She isn’t a snowplough. The sound of singing down the corridor. The girls are here. Someone says ‘doughnut’, probably Carol, but she can’t be sure. She smiles to herself. More sugar. She only had light jobs left. She’d done most of the heavy work the previous afternoon. If you worked hard on the afternoon shift there wasn’t so much to do in the morning. She would go over the floors with the fluffy brush, and the art table in Room 2 needed a good wipe with a damp cloth. She screwed the handle tighter into the brush head. It was always coming loose. She’d mentioned it to Tommy, but he had just hmmphed, probably his mind was on his next bottle of whisky. She went into Room 2 and tore off a length of sellotape from the dispenser thing on the art table. She tested the handle. It seemed to be holding. It would do for now, anyway. She set-to on the floors. She liked the way you could see the result straight off – it was dirty, you cleaned it, it was clean. That was the only good thing about the job. That and the money, of course. And the way you could lose yourself in it, not having to think, with the light slowly starting to come through the windows. Things hadn’t been going too well lately, although they were a lot better than before. God knows Robert had been on the dole long enough, then he was away through in Glasgow doing that training scheme till he got his certificate. She was so proud of him. Things hadn’t been easy. He used to sit and tell her in the evenings, when he came home for the weekends from his digs, that all he wanted in the whole world was a wee shop. Then he passed his exams and after a bit of searching he got it. He got his wee shop. He got what he wanted. It was a dream come true. She did as much as she could. Every day when she finished at the school she went home to change then walked down to the bus stop. She spent all day helping out, arranging and rearranging things on the counter – watches, earrings and necklaces – and serving the occasional customer. She would have stayed longer, but she had to be back here again for 4 o’clock and her afternoon shift. It was tiring, but it was worth it. Anything to keep him happy. He hadn’t been very happy lately. Something had happened. It shouldn’t have mattered, but it did. They’d spent a few evenings making display mats for the window, nothing fancy, just small sheets of plywood covered in green felt, stuffed with tissue paper. It was her idea. They’d laughed about it. It would do for a beginning. Then on Monday that woman from the fancy Jewellers had come in for a nosey. ‘You must have had a good time making your wee mats for the window,’ she’d said. Robert had clammed up there and then. He was still in the huff. Three days; it wasn’t a record. She knew the signs. He needed time to work through things, until they were worked out. And his temper. But his late nights were back; the ashtray that morning had been full to the brim with cigarette ends. God knows what time he had come to bed. She knew he wouldn’t sleep in, though. He had an alarm on his watch. He slept with it under his pillow. The clock in the foyer says half past seven. The cleaners’ cupboard is empty – the cups have been washed and are standing upside down on a towel on the draining board. The girls are still working. She props the brush in the corner and hangs the cloth on the hook. In the staffroom there is no smell of tea. She has forgotten about Tommy, the useless article. She fixes the hose attachment to the sink and fills the urn with water, throws in a handful of teabags and waits by the window till it starts to boil. The house is on the other side of the fence. Robert is pulling shut the front door. She could wave, but she doesn’t. He doesn’t know that she watches him like this every morning. My man. The Watchmaker. They are doing everything right. Things have started to go well for them. If only he wasn’t so sensitive, it would make their lives so much easier. She sits with the girls till quarter past eight. Cakes. Chocolate ones. She tries not to think about sugar. Tea and cakes, a smoke and a laugh. You only live once. And here comes Tommy with his shovel. The girls smile at each other. Jean has her coat on. She is already at the door. She will have to hurry or she will miss her bus. Tommy puts a hand out to her. The skin is pale and smooth, like a girl’s, but not like the girls who clean the school, whose hands are...‘Look, Jean,’ he says. ‘I’m really sorry.’ It isn’t the first time he’s been late, but he’s never apologised before. Maybe he is trying to change his ways. ‘I’ll see you all tomorrow,’ says Jean, and lets the door swing shut behind her. She crosses the playground quickly. Out on the pavement, she is pleased to see that Tommy has, despite his hangover, cleared away the ice. At first, she thinks she has left the radio switched on. But it’s too loud. And it isn’t Radio 2. Someone is crying in the kitchen. He is sitting on a stool next to the table, his head bent forwards, cradling one of his arms. His left hand is wide open, as if he has just dropped something that was too hot to hold. ‘I think I’ve broken my wrist,’ he says. They will have to go to the hospital. There is a bus due. She looks at the cooker, she doesn’t know why. The front ring is covered in crumbs. ‘I’ll go and get changed,’ she says. She is perched on the edge of the bed, kneading the hem of her good skirt. She hasn’t put it on yet. He is a blamer. Things had been going so well. But it was no one’s fault. Yes it was. It was her fault. It is her fault. It is always her fault. It is always her fault. She can never do anything right. Daylight is struggling to come through the curtains, suddenly slanting across the tangle of sheets. So much time together, so many years, and this is where they are. This is where she has put them. The only sound is him cursing downstairs; he is kicking something. Even the clocks seem to be listening, all of them, silently mocking her from the shelves, that sarcastic smile stuck to their faces, telling her that if she dreams hard enough everything will be fine, that it will be the way she wants it, that she’s a star. Andrew McCallum Crawford grew up in Grangemouth, an industrial town in East Central Scotland. He studied Science and Philosophy at the University of Edinburgh and went on to take a teaching qualification at Jordanhill College, Glasgow. His poetry and short fiction have appeared in Lines Review, The Athens News, Junk Junction, Ink Sweat and Tears, McStorytellers, Weaponizer, New Linear Perspectives, Spilling Ink Review, Drey 2 (Red Squirrel Press), The Legendary, the Midwest Literary Magazine and the The. His first novel, Drive!, was published in 2010. He lives in Greece.